Urinary tract infections are a serious, but common, health problem that affects millions of people each year. Women are especially prone to urinary tract infections. A urinary tract infection (UTI) can occur anywhere in the urinary system: kidneys, bladder, urethra. Infections are divided into "upper," when the kidneys are infected, and "lower," affecting the bladder and the urethra, the tube that channels urine from the bladder. When the kidney is involved, the infection is also called "acute pyelonephritis." Lower infections are called "cystitis"or simply "bladder infections." The key symptoms of UTI are frequent urination, low-grade fever, cramps or heaviness in the lower abdomen, unpleasant smelling and cloudy or dark-colored urine. Our combination contains cranberry extract, vitamin C (Ascorbic acid), L-methionine and Pantothenic acid. This combination has been proven to have the synergistic action in the UTIs and also help to prevent the recurrence of infections. This combination has been found to be safe and effective without the side effects of antibiotics. Our combination contains cranberry extract, vitamin C (Ascorbic acid), L-methionine and vitamin B5 (Pantothenic acid). This combination has been proven to have the synergistic action in the UTIs and also help to prevent the recurrence of infections. This combination has been found to be safe and effective without the side effects of antibiotics. ● Helps to maintain normal function of the urinary tract. ● Prevents urinary tract infections. ● Useful in skin healing. Cranberries are a group of evergreen dwarf shrubs or trailing vines in the subgenus Oxycoccus of the genus Vaccinium. Cranberry is a relatively small, red berry which grows on low-hanging vines in temperate zones in many regions of the world. Cranberry is a member of the same family of plants as bilberry and blueberry. The active ingredients in cranberry include chemical compounds called proanthocyanidins. Proanthocyanidins are potent antioxidants that appear to be able to decrease bacterial adherence to the bladder epithelium cells. The main benefit of this action is that bacteria have less likelihood of grouping together to cause bladder infection, urinary tract infections and other related conditions. Vitamin C, medically known as ascorbic acid, is a water soluble nutrient found in fruits and vegetables and also as an over the counter supplement. Vitamin C has antioxidant qualities. Our body cannot produce vitamin C, and thus is important to obtain it as a supplement. Dietary sources of vitamin C include citric fruits, berries, kiwi, red pepper, broccoli, Brussels sprouts, cabbage, tomatoes, cauliflower, green pea, spinach and potatoes. Pantothenic acid is a vitamin, also known as vitamin B5. It is widely found in both plants and animals including meat, vegetables, cereal grains, legumes, eggs, and milk. Vitamin B5 is commercially available as D-pantothenic acid, as well as dexpanthenol and calcium pantothenate, which are chemicals made in the lab from D-pantothenic acid. 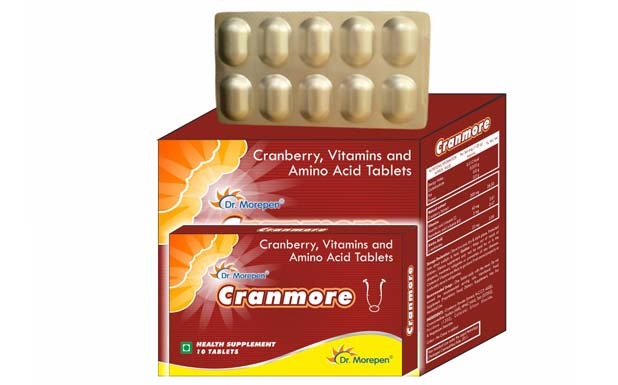 Cranberry : The mechanism of action of cranberry has prompted much scientific discussion. It was first hypothesized that acidification of the urine contributed to an antibacterial effect. The current proposed mechanism of action focuses primarily on cranberry's ability to prevent bacterial binding to host cell surface membranes. In vitro studies have observed potent inhibition of bacterial adherence ofEscherichia coli and other gram-negative uro-pathogens. Cranberry has been found to specifically inhibit hemaglutination of E. coli by expression of types 1 and P adhesin through the component compounds fructose and proanthocyanidins. Vitamin C : Its also known as ascorbic acid–serves a dual purpose in urinary tract infection treatment: It makes urine more acidic and therefore more hostile to bacteria, and it reinforces the body's immune system. L-Methionine : Treatment with antibiotics may be associated with the risk of developing resistance. One alternative to antibiotic drug administration is provided by the essential amino acid L-methionine. The beneficial effect of methionine is due to an excretion of acidic valences with urine and a decrease in bacterial cytoadherence. Pantothenic Acid : Pantothenic acid, or vitamin B5, fights inflammation and has antioxidant properties that may prove useful in preventing urinary tract infections. There are no major interactions reported. Cranberry and warfarin has been suggested in case reports; however, evidence of casual relationship is lacking. Vitamin C interacts with alumunium. There are no interactions reported of Pantothenic acid and L-methionine. No severe side effects have been reported. Common side effects are: diarrhea, allergic reactions, confusion and restlessness.